Good morning all and a very happy Tuesday. Well, this is exciting! 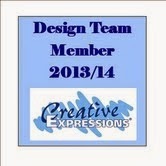 My first "proper" post as a member of the Creative Expressions Design Team! So without further ado, here is what I came up with using the new A5 stamp plate "Winter Flowers". Stamp the Christmas Rose with black Archival Ink onto a piece of Coconut White card and heat emboss with Cosmic Shimmer Clear Embossing Powder. Colour the flower with Cosmic Shimmer Drawing Inks. I've used Meadow Lush and Lime Burst for the leaves and Cosmic Skin and Pearl Shine for the flower heads. The centres have been painted with Rich Gold and Ancient Copper. Die cut the picture using Spellbinders Labels 28. Using the same die, draw around the outer edge of it onto Green cardstock and cut out with scissors. This enables you to make a matt that is just the right size and also gives you more flexibility with the dies making them even better value for money! Using the Dainty Dots M-Bossability Folder, emboss a piece of Coconut White Card. When using the Grand Calibur, make sutreere you use the Raspberry plate without the tan mat. Use 3d foam pads to attach the flower panel to the card. To finish, tie a double bow and attach with a glue dot. Add a silver Dazzler to the centre of the bow. Use another glue dot to attach it after peeling off the 3d foam pad. Stamp the sentiment with black Archival Ink and heat emboss as before. Cut it into a banner shape, matt and layer it onto green card. Gently bend the banner and stick to the card with glue at the ends and foam pads where the banner rises. Add a couple of Crystal Stick Pins to finish. Well, that's the first of my DT pieces and I thoroughly enjoyed making it. It's a nice quick and effective card to make. The Drawing Inks are fantastic, lots of Mica to give shine and glimmer and also a very fine brush to paint with. The other great thing, if you're a bit clumsy like me, is that they are non-spill!! You may have noticed that I have some blog candy on offer. To enter, all you have to do is sign up and follow. When I reach 300, I'll do the draw. Hello Pam, thanks for visiting,well I snooped around, how exciting going to a dig at Stonehenge, both makes from Creative Studios are GORGEOUS, your gold cards are lovely, your first proper post is fantastic,your coloring is fabulous, love the layout and the stick pin, thanks so much for sharing and a big congrats for making the DT, hope you have a wonderful week..